Marvelous Multiagers! : Happy 100th Day!!! Yay yay for 100th Day!! I've built this up a LOT in the past few weeks, and luckily my mad party-planning skillz did not disappoint! Let's go through the day chronologically! First, we made 100th Day glasses. They were seriously obsessed with these. I could not stop laughing at them all day because they looked so silly! I got the template from the wonderful Jenn at Finally in First. Her 100th Day post from last year was actually the post that made me want to read everyone's blog and start my own!!!!! So it was fitting that I used a few of her ideas today! I know, I know................ there are only 12 of them. Next we made ourselves as 100 year olds! I was originally inspired again by Jenn but also by Jessica from Welcome to Room 36. I took the writing idea from someone and I can't remember who! Also I can't find who it is! So please tell me if you know. They had to write what they'd be able to do and what they wouldn't be able to do at age 100. I will be able to watch as much TV as I want, but I will not be able to run. I will be able to cook but I will not be able to run so fast. I will be able to make macaroni and cheese but I will not be able to do backflips. I will be able to go to work, but I will not be able to make grandmas out of paper. The last one CRACKED ME UP! I was dying laughing. I guess she means because she won't be in school, she can't make herself as a 100 year old when she is 100. Haha!!!!!!!!! Also I'm guessing she was perplexed about why we were randomly "making grandmas out of paper." Haha! I am still dying now. We read a super super cute book! The kids looooooooooooved it and it was fun to read! 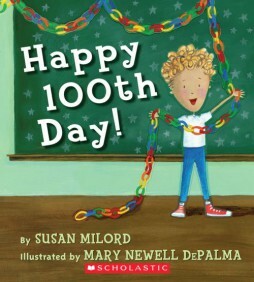 Also if you are desperate for 100th Day activities, this book mentions several for you to try out! Later on, we counted out 100 fruit loops by 10s and made necklaces! I didn't try this out before we did it together.... which was an issue. They could not get those fruit loops on the yarn!!! Thankfully, one of my first graders' moms had dropped in and suggested covering the end of the yarn with tape! OMG! I love you, mom of my student. Later on, the technical party began! We had four stations. One was finishing the necklaces (haha), one was making a 100th day trail mix, one was rolling a die 100 times (which I got from Made for First Grade) and recording the numbers they got, and one was taking 100 steps and seeing where they ended up. I also covered the door with streamers. Let me just say........... streamers are a kid magnet. One last message to end this super long but super AWESOME post! One of my second graders came to school and said, "It's the 100th day of school. Today is the day when boys become men and girls become women. I need to start thinking about getting engaged soon." She said it very solemnly and I was beside myself. My kids can be a handful but they are hilarious!! I love all of your activities. Looks like you guys had a great time-and you survived the first 100 days of school! Our 100th day is tomorrow-it is such a fun day! Maybe I'll take some photos for my blog. I loved your 100th day writing activity. Gives me some ideas as to how I can do something like that for my 5th and 6th graders. Thanks for sharing! I hate to tell you this.......... but that's all of them!! I have 5 second graders and 7 first graders. It is pretty ridiculous. But next year I'll have 18! Movin' on up. Hi. I'm your newest follower. The 100th day is always so much fun. Thanks for sharing!